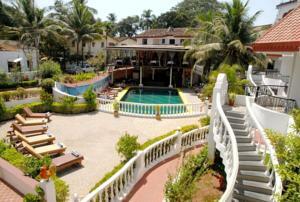 Located a 4-minute walk from Calangute Beach, The Goan Village offers an outdoor pool, restaurant and bar. Modern rooms have a balcony and come with coffee and tea making facilities. The Goan is 9 km from Saturday Night Bazaar and 12 km from Panjim City. Goa Dabolim Airport is 46 km away. Rooms are equipped with both air conditioning and a fan, with bathrobes included. En suite bathrooms have hot water and toiletries provided. Guests can make sightseeing arrangements at the tour desk or visit the business centre for their communication needs. Laundry and dry cleaning services are available. Traditional Indian food is served in the hotel’s restaurant, which also houses a bar. Free! One child under 5 years stays free of charge when using existing beds. One child from 6 to 12 years is charged INR 750 per night and person in an extra bed. One older child or adult is charged INR 1000 per night and person in an extra bed. There is no capacity for cots in the room. Supplements will not be calculated automatically in the total costs and have to be paid separately in the hotel.